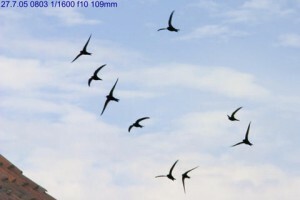 A leaflet written to help builders be aware of the needs of swifts is now available. You can download your copy here. PLEASE give this leaflet out at every opportunity – to builders and to householders who are having work done on their properties. The idea for a Ludlow Swift Group was floated in 2010 as a Ludlow 21 project to mark International Year of Biodiversity – which was the start of the International Decade of Biodiversity. A number of visitors to the Green Festival back in August 2010 showed an interest in such a group and Ludlow 21 together with Shropshire Wildlife Trust and Shropshire Ornithological Society formally launched the group at Ludlow 21’s AGM in January 2011. Edward Mayer of Swift Conservation travelled from London to tell us about these fantastic birds and about many of the projects he has been involved with both in the UK and overseas to help provide suitable nesting sites and help ensure their future. Swifts are a welcome part of the Ludlow skyline each summer and many visitors to the town as well as residents look out for them each year. They return in the middle of April but are only here for a few weeks to breed before starting their migration back to Africa at the end of July. We tend to take it for granted that they will return but we really have no idea whether their numbers are increasing, staying stable – or as some say – decreasing. Nationally it is known that numbers have plummeted by 50% since 1997 and people are now become aware that action must be taken now if these birds are to survive into the future. We do not know where they all nest in Ludlow but we do know that we have – or at least did have – a lot of suitable buildings where these birds could find holes between stones or in the eaves to nest. However the steady stream of renovations and home improvements could be endangering the survival of these birds: we all like to make our houses sealed and completely weather proof but this is seriously reducing the number of swift nesting sites. We can, with thought and planning, improve our homes and leave room for these birds. There is a great deal of expertise about incorporating swift nest sites in house improvements and new builds – these can either be part of the building or specialist boxes (there are several designs available). There are also plenty of opportunities to provide nest sites for swifts on public buildings – car parks, church towers and recently several hospitals in the UK are incorporating swift boxes in their building designs. Swifts are very faithful to their nest sites and trying to get them to take to new boxes can be a long process. Each year the birds will return to the nest they used last year and will try repeatedly to access it if it has been blocked – intentionally or inadvertently – since the previous summer. Young birds will often look for a new nest site before leaving for the winter. It has been found that playing a CD of swift calls close to the new box can be important in persuading the birds to take up new nesting sites. Swifts are protected by law but this does not offer them as much protection as it should. survey the swift population in Ludlow and its environs and establish a map of known breeding sites. This will also be fed to the RSPB’s swift survey. raise awareness of these birds and their needs and to ensure that nest sites are not lost during house renovations. We are indebted to Swift Conservation and Action for Swifts for help, advice and inspiration.